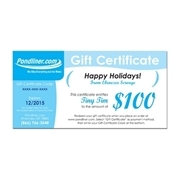 Surprise the water garden enthusiast in your life with a Pondliner.com Gift Certificate. Unlike most companies, we let you decide the exact dollar amount you'd like to put on the gift certificate. Instead of having to guess which pond supply gifts your friends of family member wants most, you can just provide them with the money to purchase whatever they'd like. Gift Certificates will expire 1 year after purchase. Be sure you select who you want the Pondliner.com gift certificates sent to and how you want them to get there to make sure they arrive in the right place at the right time. If you plan on e-mailing any gift certificates to someone besides yourself, please enter the appropriate e-mail address in the box below the delivery selections.